Departure at 9:00 AM and arrival on the same day at 5:00 PM. Visit to- Iskcon temple, Vidhana Soudha, Lalbagh, Bull temple, Tippu’s Palace, Cubbon Park, Museum and Emporium. Includes transportation by Non A/c coach and parking. Guide fees and entrance fees to be paid separately. Arrival on the same day at 11:15 AM. Visit to- Daria Daulat, Gumbaz, Ranganath Swamy Temple, St. Philomena’s Church, Chamundi Hills, Mysore Palace and Brindavan Garden. Includes transportation by Non A/c coach and parking. Entrance fees and guide fees to be paid separately. Departure from Bangalore at 1:00 pm (overnight journey). Arrival in the morning at Shirdi, followed by pick up and transfer to hotel. Visit to- Sri Sai Baba Temple and Shanisinganapur. Overnight stay at Shirdi. Check out of the hotel, visit Shirdi Sai Baba Temple. There will be a drop to the bus station by afternoon for departure to Bangalore. Morning arrival at Shirdi, followed by pick up and transfer to hotel. By noon, there will be a visit to Sri Sai Baba Temple and Shanisinganapur. Overnight stay at Shirdi. 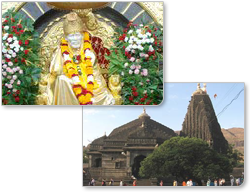 Visit to- Shri Sai Baba Temple, Panchavati Traimbakeshwar, Nasik and back to Shirdi. Overnight stay at Shirdi. In the noon the passengers will be dropped at the bus station for departure to Bangalore. Arrival in the morning in Bangalore. Departure from Bangalore at 7:30 am to Mysore, enroute visiting Srirangana patna, Daria Dault, Gumbaz, Ranganatha swamy temple. Arrival in Mysore by afternoon, followed by visit to Palace and Brindavan garden. Overnight stay at Mysore. Departure to Ooty, followed by visits to Nanjundeshwara temple, Ooty Botanical Garden and Ooty lake. Departure to Bangalore by night. Arrival in Bangalore by morning. This trip includes transportation by Non A/c coach one night at Mysore and parking. Guide and entrance fee is to be paid separately. Departure from Bangalore to Mysore, enroute visit to Srirangapatna, Daria Dault, Gumbaz, Ranganath swamy temple. Arrival at Mysore by noon, then visits to- St. Philomena’s Church, Chamundi hills, Mysore Palace and Brindavan garden. Overnight stay at Mysore. Departure to Ooty in the morning, enroute visit Nanjundeshwara temple, Ooty Botanical garden, Ooty lake. Overnight stay at Ooty. 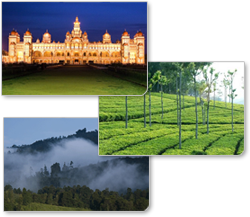 Check out of the hotel in the morning, visit Coonoor and departure to Bangalore in the evening. Arrival in Bangalore by morning. Departure from Bangalore to Mysore, enroute visiting Srirangapatna, Daria Dault, Gumbaz, Ranganath swamy temple and arrival in Mysore by afternoon. Visit to St. Philomena’s church, Chamundi hills, Mysore Palace and Brindavan garden. Overnight stay at Mysore. Departure from Mysore to Ooty in the morning, enroute visiting Nanjundeshwara temple, Ooty Botanical garden, Ooty lake. Overnight stay at Ooty. Check-out of the hotel in the morning, departure from Ooty and arrival in Kodaikanal by evening. Check-out of the hotel in the morning, and start with sight-seeing in Kodaikanal, visit- Pillar rock, Green valley lake, Solar physical observatory, Bryants park and departure to Bangalore by evening. Departure to Coorg in the evening. Overnight journey. Arrival in the morning, followed by transfer to the hotel, visit Omkareshwara temple, Raja seat, Bagamandala, Triveni sangama, Abbey falls. Overnight stay at Coorg. Departure from Coorg, visiting Golden temple, Nisargadhama and Dubare forest, Harangi dam. Departure to Bangalore in the night. Arrival in Bangalore in the morning. Departure from Bangalore to Ooty in an overnight journey. Arrival at Ooty in the morning and transfer to hotel. Then visit to- Ooty Botanical garden, Ooty lake. Overnight stay at Ooty. Check-out of the hotel in the morning, and visit Doddabetta, Coonoor. Departure to Bangalore in the night. Departure from Bangalore to Ooty in the night. Arrival at Ooty in the morning, transfer to hotel, leisure and overnight stay. 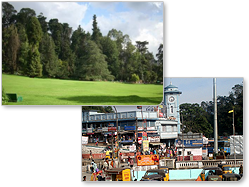 Visit- Ooty lake, Botanical garden, Doddabett, Coonoor. Visit to- Pyakara dam, Filmi chakar and back to Ooty. Departure to Bangalore in the evening. Arrival at Bangalore in the morning. Departure from Bangalore to Ooty, overnight journey. Arrival at Ooty in the morning, followed by transfer to hotel. 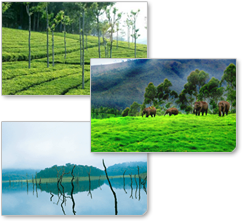 Then visit to- Lake, Botanical garden, Doddabetta, Coonoor. Departure to Kodaikanal by mini coach and arriving in the evening. Visit to- pillar rock, Green valley lake, Solar physical observatory, Bryants par and departure to Bangalore in the evening. Departure from Bangalore in the night at 9:15 pm. Arrival at Kodaikanal in the morning and transfer to hotel. Check-out from the hotel in the morning and start local sightseeing, visit- Pillar rock, Green valley lake, Silver cascade, Bryants park and departure to Bangalore at 7:00 pm. Arrival in the morning at Bangalore. Departure from Bangalore to Madurai in a Volvo A/c coach at 10:00 pm, for an overnight journey. Arrival at Madurai in the morning. There will be a pickup service from the bus station and transfer to the hotel. Visit- Madurai Meenakshi temple, Choknadhar temple, Alagar temple and Lord Muruga temple. Departure to Rameshwaram, visit Hanuman temple, Pamban bridge, Navapanigrahm, kasha viswanath temple, 24 undalas, Ram parvath, Sita parvath, Hanuman parvath and Vishnu temple. Departure to Kanyakumari, visit- Sunrise temple, Triveni sangam, Devi kumara Amman temple, Gandhi mantapam, Vivekananda rock, Tiruvalluer statue, Susunderam temple. Departure to Madurai in the afternoon and drop at the bus station. The departure to Bangalore at 9:30 pm. Departure from Bangalore to Kodaikanal in an overnight journey. Arrival in the morning and transfer to hotel. Visit- Pillar Rock, Green Valley Lake, Silver Cascade, Bryants park, night halt at Kodaikanal. check out of the hotel in the morning, proceed to Munnar. check out of the hotel in the morning and proceed to Thekkady. Visit wild life Sanctuary known for its Abundant Flora and Fauna, boat ride at Periyar Lake. Departure to Bangalore in the night. Evening departure from Bangalore to Cochin at 9:00 pm, in an overnight journey. Arrival at Cochin in the morning, pick up from bus station, transfer and proceed to Munnar and transfer to hotel. 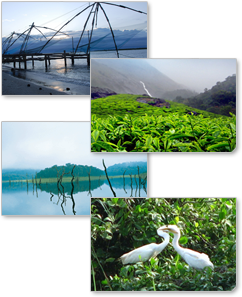 Sightseeing at Munnar, visit- Mettupatti Dam, indo Swiss cattle, Breeding Farm, Echo point, Kundala Dam, night halt at Munnar. Departure to Thekkady and transfer to hotel by afternoon. Visit Wild Life Sanctuary known for its abundant Flora and Fauna, boat ride at Periyar Lake, night halt at Thekkady. Check-out of the hotel in the morning, and depart to Cochin. The arrival will be on the same day, followed by an evening drop at the bus station to board the bus to Bangalore. Departure from Bangalore at 9:00 pm in an overnight journey to Cochin. Arrival at Cochin in the morning, with pick up from bus station for transfer to Munnar. 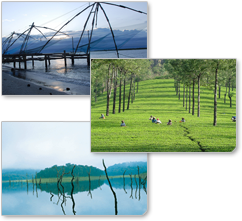 Full day Munnar sight seeing visit Mettupatti dam, Echo point, Kundala Dam, nighthalt at Munnar. Morning depart to Thekkady and transfer to hotel afternoon visit Wild Life Santuary, known for its abundant Flora and Fauna, boat ride at periyar Lake, night halt at Thekkady. Morning check out of the hotel, proceed to kumarakom/Alleppy, same day arrival, check in A/c House Boat, night halt at House Boat. Morning check out of the House Boat, depart to Cochin, same dau arrival, noon free for personnel activities, evening departure to Bangalore. Departure from Bangalore in the evening, in an overnight journey. Arrival in the morning at Panjim, followed by transfer to hotel. Morning start for North Goa sightseeing, visit River Cruise, Calagute Beaches, fort Aguda, Light House point, Guada Beach, Vagaotor Beach, Anjuna Beach and overnight stay at Panjim. Morning start for North Goa Sightseeing, visit Harbour Point, Bogmalo Beach, evening drop at bus station to board the Coach to Bangalore. Evening departure from Bangalore by Volvo A/c Coach in an overnight journey. Morning arrival at Hyderabad, transfer to hotel, proceed to Ramoji Film city (Sightseeing by coach) night halt at Hyderabad. Check out of hotel in the morning, visit Salarjung Museum, Char minar Temple, Quli Qutub Shah Tombs, Lumbini Park, and evening departure to Bangalore. 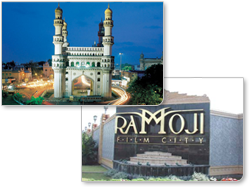 Arrival in the morning at Hyderabad, transfer to Ramoji Film city, sightseeing and overnight stay at Ramoji Film City. 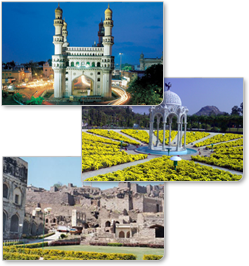 Morning proceed to Hyderabad for sightseeing, visit Salar Jung Museum, Charminar, Birla Temple, Quli Qutub Shah Tombs, Lumbini Park, snow World night, and evening departure to Bangalore. Evening departure from Bangalore at 9:00 pm, by A/c Volvo Coach, in an overnight journey. Arrival in the morning at Hyderabad, transfer to hotel, afternoon visit to Sound and Light show(Golconda Fort) Durgam Cheruvu, Botanical Garden (By Coach) and overnight stay at Hyderabad. Morning proceed to Ramoji Film city for sightseeing, and overnight stay at Ramoji Film City. Morning departure back to Hyderabad for Sightseeing, visit Salarjung Museum, Charminar, Birla Temple, Quli Qutub shah Tombs, Lumbini Park, Snow World night, and evening departure to Bangalore.